HE has celebrated Mass on top of Mount Kilimanjaro, sat around the campfire with the Aboriginal people of the Pilbara in Western Australia and now this priest from Tanzania is finding his feet in the heart of Brisbane. Holy Spirit Father Tom Kessy says it’s a struggle for him to adapt to his new life as parish priest at Dorrington, only a few kilometres from the CBD. He may say that but he has a habit of handling the big challenges, with faith as his firm footing. He’s climbed Mount Kilimanjaro, Africa’s highest peak, five times – most recently, only last year. “On that occasion it was a chance to celebrate Mass at the summit to mark the 100 years since our Blessed Virgin Mary appeared to the three children at Fatima (in Portugal),” Fr Kessy said. Bishops in Tanzania had asked him to make the climb and to celebrate Mass at the peak to mark the anniversary. “The reason why, is because, our country, Tanzania, was put under the protection of Our Blessed Virgin Mary when it gained independence in 1961,” Fr Kessy said. “At that time also they put a Torch of Freedom at the summit with a prayer of Our Blessed Virgin Mary. Fr Kessy had two Australians and eight Tanzanians accompany him to the top on a climb for charity. His links to Australia stemmed from serving 16 years as parish priest of South Hedland in the Pilbara region of Western Australia from 2002. In the beginning, it was a huge challenge having lived all his life in Tanzania and then having to adjust to life in one of the remotest parts of Australia. It became one of the most rewarding experiences of his priesthood, and he came to love living and serving among the Aboriginal communities there especially. Life as a priest has been full of ups and downs, including being expelled from the seminary as a young man. Fr Kessy entered the minor seminary in his home diocese of Moshi, in the Kilimanjaro region, at the age of 15 and seven years later he was expelled. “It was a strike. We were striking because the food was not good and because of other issues …,” he said. After several years out of the seminary, it was a chance encounter with a man begging on the streets that changed the course of his life again. Life was comfortable and full of promise. Having studied Economics and Statistics at university, young Tom had a good job with the Minister for Agriculture, he was living in Tanzania’s capital city Daressalam and he was in a serious relationship with a woman he had thoughts of marrying. “Since my office wasn’t very far from the cathedral, I used to go for Mass every evening after work at 5pm,” Fr Kessy said. “I used to live with my brother. But on every Friday, my three young brothers who were now studying in the capital city, used to come for Mass and then we’d go for fish’n’chips. “I used to give them 20 shillings, and that day I didn’t have the change. “Then I decided to give the 100 shillings, and the beggar really looked at me. He was shocked. Fr Kessy’s brother meant it as a joke but he had no idea his words were changing his big brother’s life. “It really struck me,” Fr Kessy said. “We went for Mass … and I really started meditating on that. The reaction of the poor man made the difference. “When he looked at me … He said, ‘you have given so much’ … because 100 shillings was a lot of money in those days,” Fr Kessy said. “That was the statement … this coming from my young brother. Fr Kessy recognised the episode as a call from God to serve the poor. “God was speaking in a very special way,” he said. Fr Kessy tried to return to the diocesan seminary, but two bishops rejected him because of having been expelled. He applied to three religious orders and the Spiritans (Holy Ghost Fathers) were the first to give him an answer. He laughs as he recalls the irony that was to follow. “Immediately after my ordination I was appointed to teach in the seminary,” he said. By the end of his term, Fr Kessy was ready for a renewal course, which normally would meant time in Europe or the United States, but the Spiritans asked him to go to Australia. That was not his choice but he accepted and was sent to South Hedland, Western Australia. He was inspired to get to know the Aboriginal people there, “to sit down to learn their stories, to encourage them, and to be among them, to be with them, and I needed to go to their communities and to give them welcome”. “We have to know, when we go to the communities, it takes time to earn their trust,” he said. “It took me more than five years to earn their trust. “And then they could welcome me and I could go and they could tell me their stories. “And some they always suffered. “And I was looking at their plight, their sufferings – the whole Aboriginal question, the whole question of reconciliation. The man who had been expelled from the seminary went on to become the leader of the Spiritans of Australia and Papua New Guinea from 2006 to 2015. 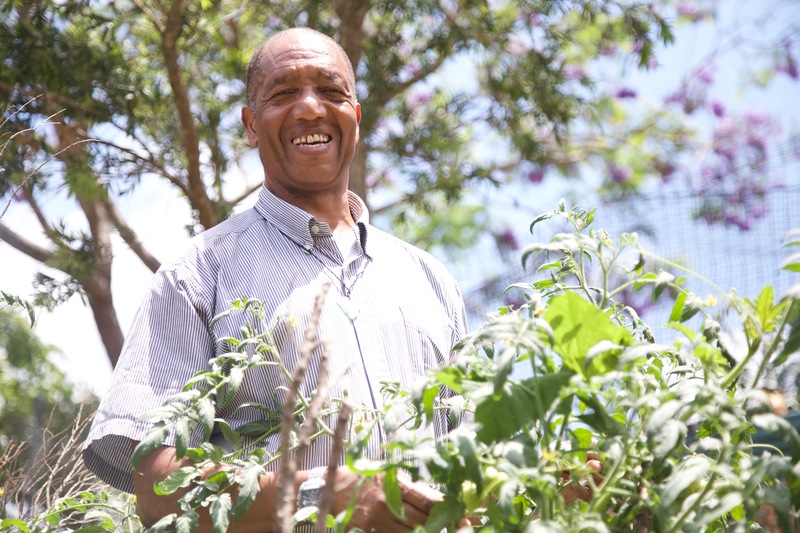 Now, as he settles in at Dorrington, Fr Kessy is taking time for some of his favourite things – gardening, walking and keeping fit. He’s carved some terraced gardens on the side of steep, rocky cutting behind the presbytery where the vegetables and fruit trees are thriving. And there’s a gym taking shape in a breezy undercover area, where the new priest has installed several weights benches – some salvaged from among the kerbside giveways and others donated by parishioners. As part of his ministry in a new setting, Fr Kessy also has plans for a Men’s Shed, and then there’s always new mountains to climb.